I've written reviews for Ultimate Spider-Man, Batman, and Daredevil, but I've been reading a lot of other comics lately without reviewing them on the blog. Instead of writing one article for each series, I'm writing mini-reviews for all of them here. 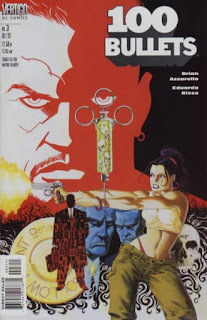 Most of the comics I'm reading are modern-day comics still in their current run, but 100 Bullets is an acclaimed neo-noir series written over the course of a decade, from 1999 to 2009. It's well-written, but I can't read this without thinking of Frank Miller's seminal Sin City, a superior series that came eight years earlier. 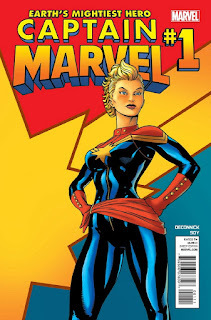 I'm no fan of the Avengers, so I was as surprised as anyone when the Least Interesting Avenger turned out to have the Greatest Superhero Comic on Shelves Today. Plenty has been said already about how awesome this series is. 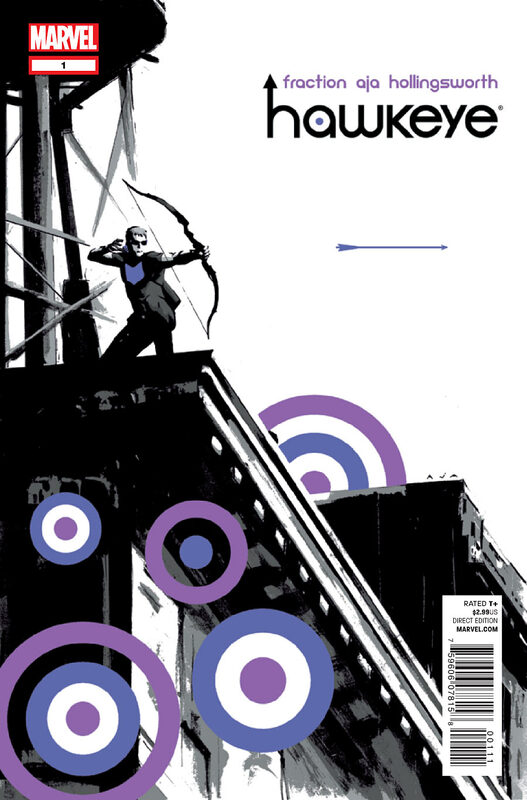 The creators understand Hawkeye is the Least Interesting Avenger, so they run with it as a story about a regular guy trying to fit into a superhero's world. David Aja's minimalist art style (look at those covers!) and Matt Fraction's satirical writing style compliment each other perfectly. Hawkguy is by far my favorite Marvel or DC comic book series. Side note: Matt Fraction also has the Greatest Comic Creator Twitter Account of All Time. As a new comic book reader, this was my first time reading a series of a superhero I'd never heard of before. Eventually I heard about Grant Morrison's original run on the series, but I started with this new reboot. And it's fantastic. 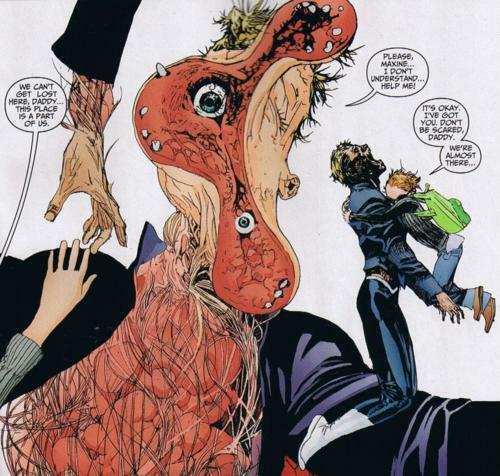 The metaphysical horror aspect is what draws you in to the series, and you stay for the relatable family-man hero. The grotesque artwork is stunning. It's got a slow first few issues, but now I'm hooked. 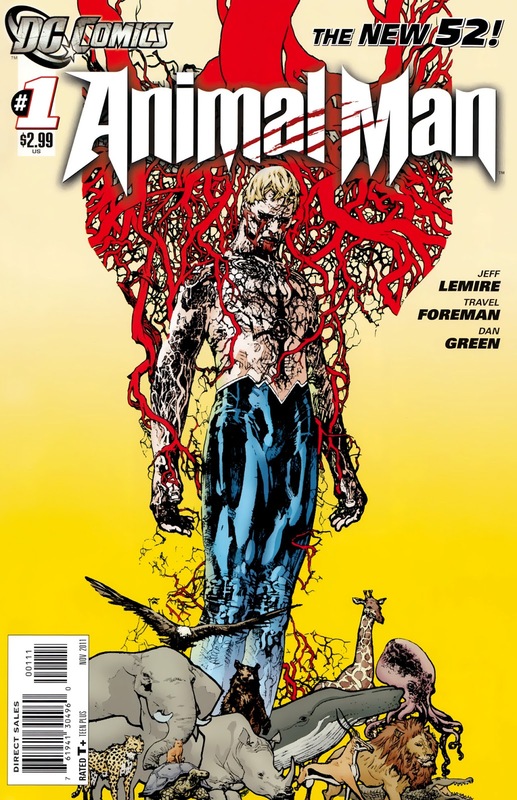 Jeff Lemire's Animal Man does a lot of crossing over with Swamp Thing, since both characters exist in the same world. I wasn't planning on reading Swamp Thing, but Animal Man is so good that its compelling depiction of the Swamp Thing made me want to read the sister series. 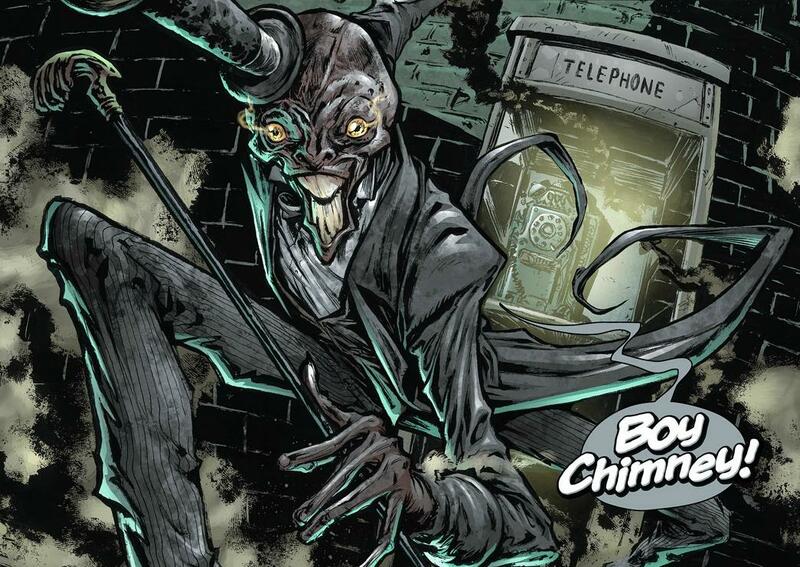 Unfortunately, despite great artwork by Yanick Paquette, Scott Snyder's writing doesn't live up to it. Maybe it's because Snyder is a hotshot at DC Comics right now and Batman is his main creative output. 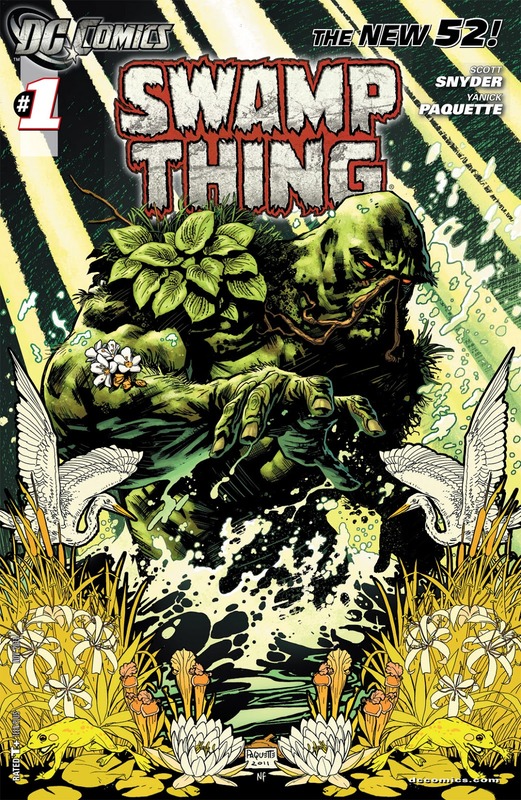 It makes sense that he's leaving the series now, since Swamp Thing is an afterthought to him. I haven't given up on the character as a whole, though, as I've heard great things about Alan Moore's vaunted Swamp Thing of years past. 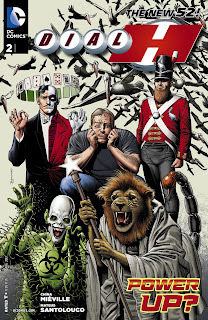 Dial H is a dark, fun, crazy story about a slacker who suddenly gains the ability to turn into random superheroes. He doesn't get to choose what he becomes--it could be anything imaginable, from Boy Chimney to Iron Snail to Open-Window Man. At first this series just seems like an excuse for the artist to design hilarious, gimmicky new superheroes, but as it goes on the story gets more complex. It feels like an indie series, not something DC Comics would put out, so of course it's being discontinued later this year. R.I.P. I didn't want to buy into the Saga hype. It was called the best comic book of 2012 by basically everyone. Described as a Star Wars-style space opera about new parents, it seemed a bit too much for me. I love the complex alien galaxy of Star Wars because I was introduced to it as a small child, but as a jaded adult, I didn't think I could embrace a guy with horns and a girl with wings and a naked lady bounty hunter with no arms and eight spider legs. It was at the top of so many year-end lists, though, that I had to cave. And I'm glad I did. I called Hawkeye my favorite superhero comic book because Saga is my Favorite Comic Book. 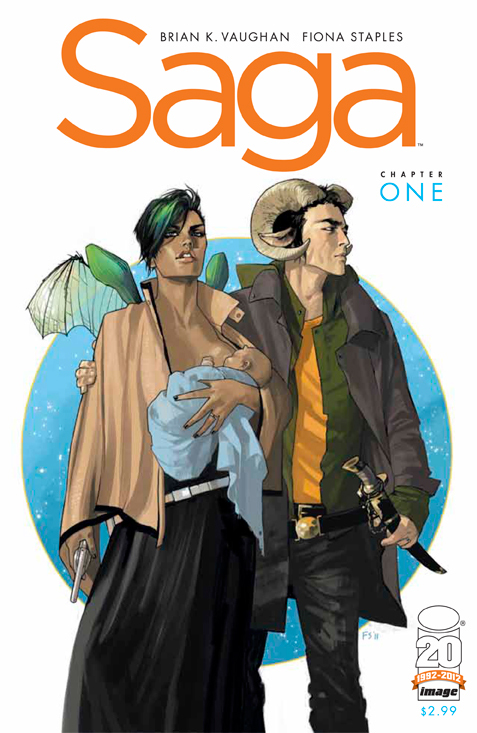 Brian K. Vaughan and Fiona Staples weave a beautiful, alien, and ultimately human tale with Saga. I hope to be delving into their world for years to come. 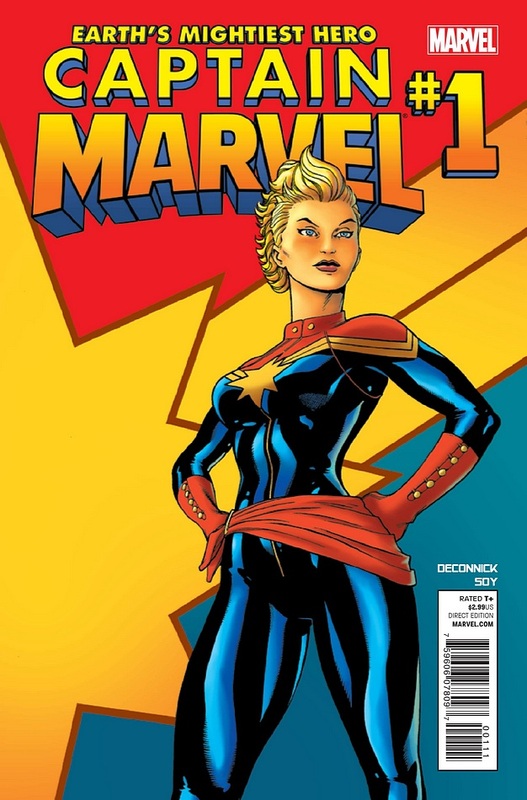 Comics are mostly a sausagefest, so I was excited to read Captain Marvel: a series about female characters, with a female writer and (for many issues) a female artist. Unfortunately, the Woman Factor is the only interesting aspect of this book. Other than that, it's an incredibly generic superhero story where she flies around and blows up bad guys. I finally got around to reading the most famous Batman comic of all time! 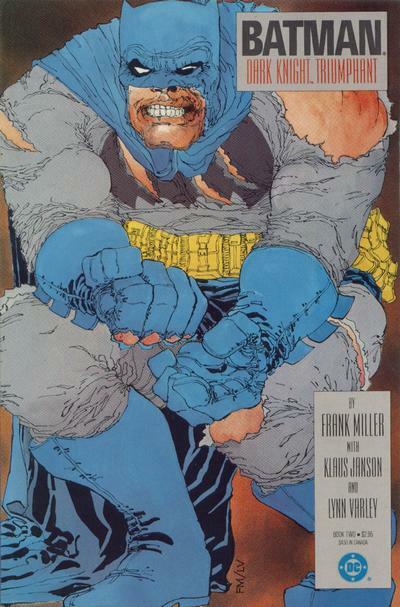 The brooding, dystopian-cyberpunk-future 1986 tale by Frank Miller is credited with ushering in a whole new era of "grimdark" comics. And it's not the most fun book to read--tons of Walls of Text with many pages featuring sixteen panels each--yet it's obvious why this book was so influential. It's interesting to see a superhero at the end of his career, when he's old and weak. 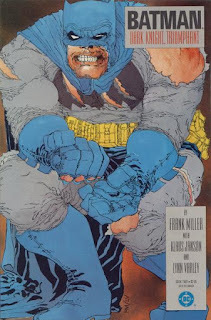 The ending is a bit of a cop-out, but The Dark Knight Returns is still a satisfying read. I especially like all the narration done through TV broadcasts; the local news anchor is just as much a character in the story as Bruce Wayne himself. This is actually two separate comic book series. 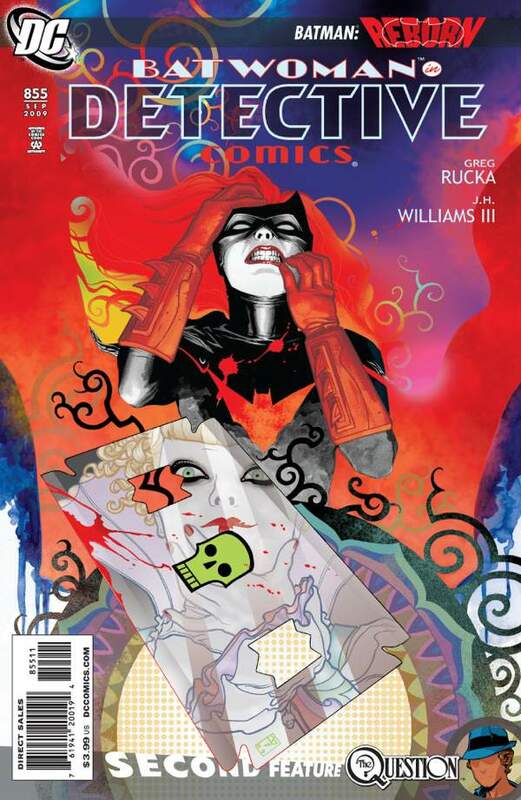 The "Batwoman: Elegy" story arc from Detective Comics in 2010, and the standalone Batwoman series that began in 2011. The Detective Comics story written by Greg Rucka and drawn by J.H. Williams III is absolutely fantastic. Rucka is one of the best writers in the business, and JHW3's intricate multi-page spreads are gorgeous. But when Batwoman got her own standalone series, Rucka was nowhere to be found. 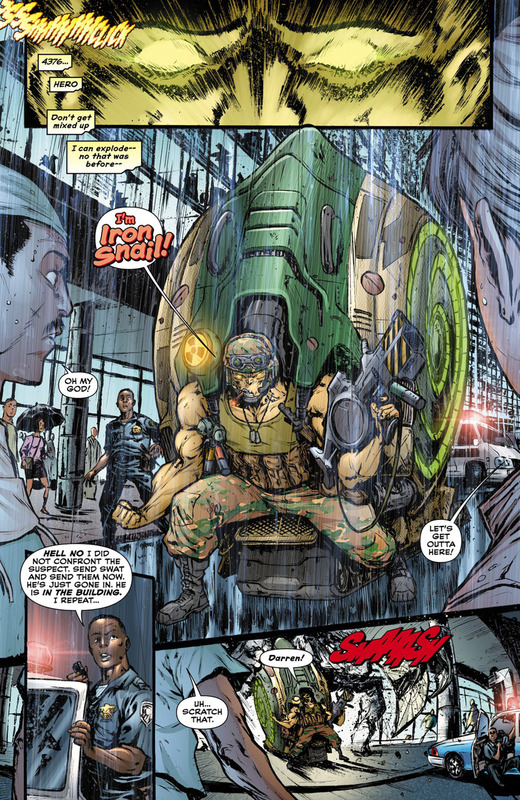 JHW3 pulled both writer and artist duties alone for a while, and the series suffered because of it. He's a great artist, but a subpar writer. To make matters worse, eventually JHW3 stopped doing the art altogether and enlisted a revolving door of artists to pencil his mediocre writing. I'd strongly recommend the Rucka/JHW3 run, collected as Batwoman: Elegy, but stay far away from the standalone Batwoman series. I'm a sucker for post-apocalyptic settings and geopolitical globetrotting, so The Massive is right up my alley. It's the story of a group of environmental activists trying to survive in a post-global warming world. At first I was put off by what looked like fairly generic artwork, but if you give it a chance, The Massive is intelligent and suspenseful. I consider myself a pretty Worldly Dude, and even I had to look up some of the topics in The Massive on Wikipedia. The characters are from all over the world, travel everywhere, and deal with all sorts of real-life issues. I didn't know anything about Tamil Eelam or Unalaska before I read this series. And even the art, which I thought was unremarkable to start, hits its stride after the first issue. 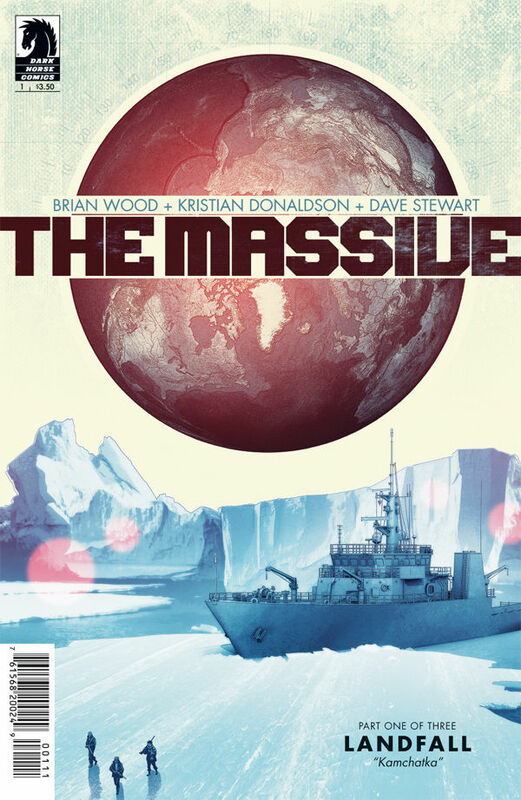 The Massive is a text-heavy comic book, but it's intellectually fulfilling in a way not many other comic books are today. 2010 Jake Shapiro. Simple theme. Powered by Blogger.